Hi there! 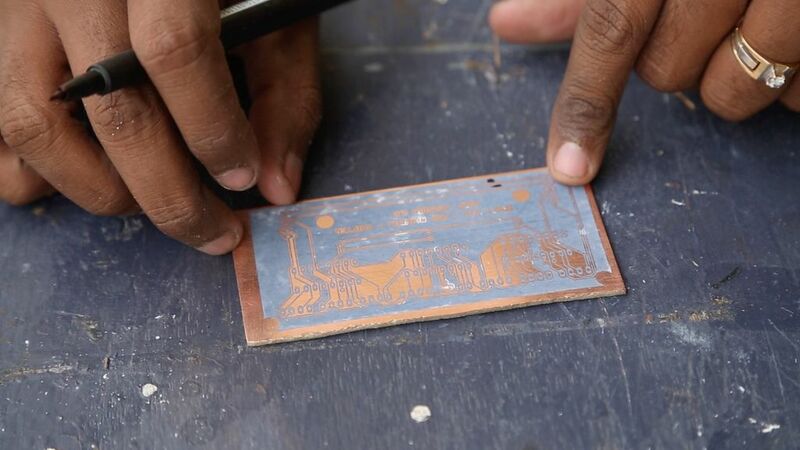 Today we will be going through the methods of etching a PCB. Most of the times an idea that strikes the mind gets dropped because of the difficulties involved in the process to achieve it. 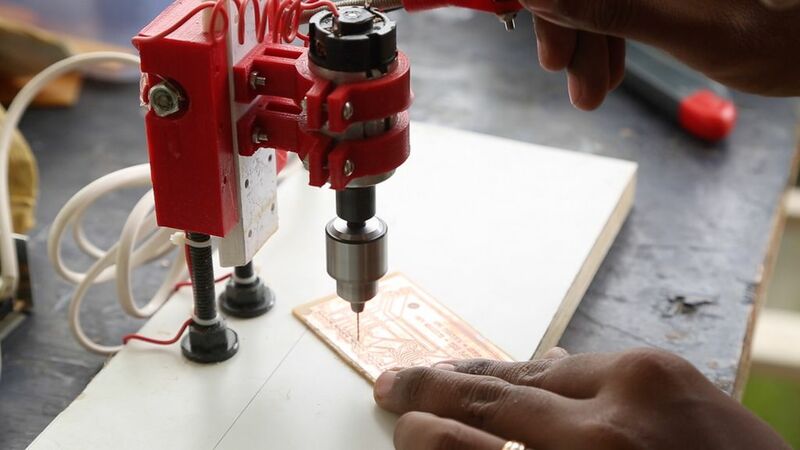 Making PCBs at home is a difficult process. 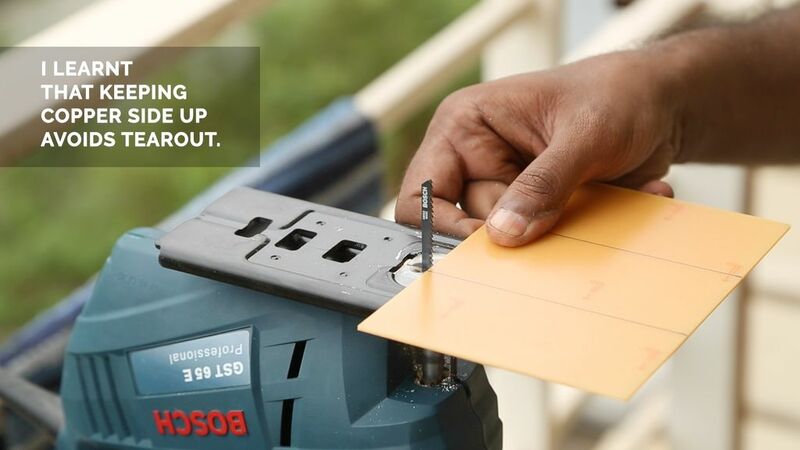 But with the right tools its not impossible. I am here to tell you the right ways to do it. Here are the tools that you will require for the Process. Laser Printer. 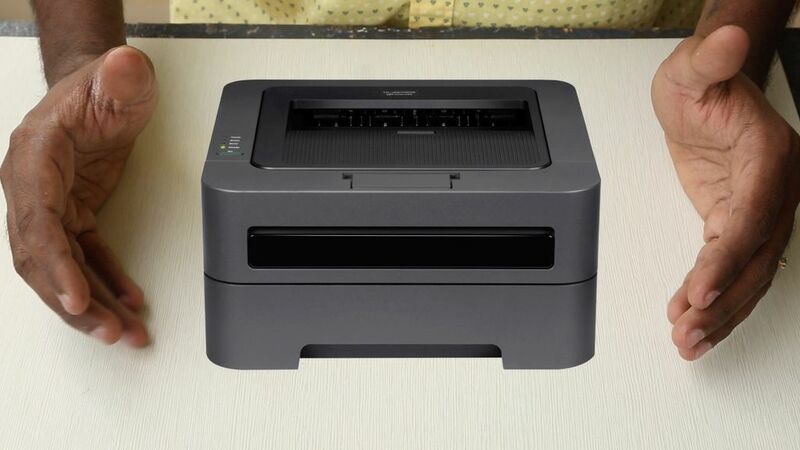 The black power inside the laser printer is a form of plastic which is electrostatic charged. So any other printer wont work for this method. Ferric Chloride. This is a messy chemical and I will telling you the do’s and don’ts. Wire mesh to clean up. 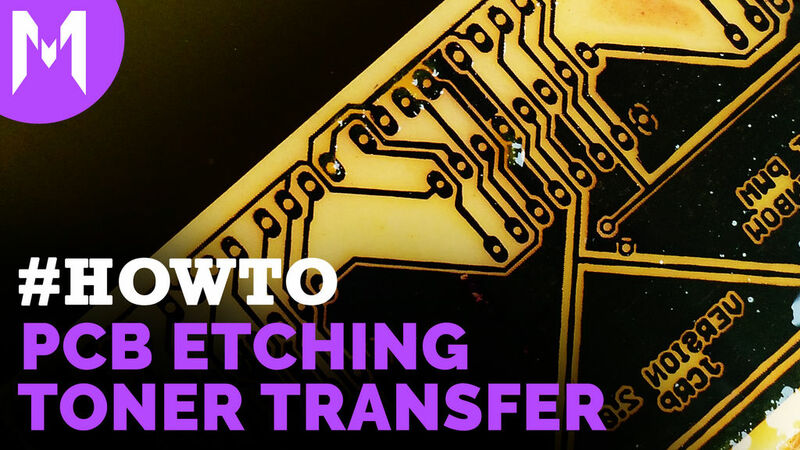 Step 2: When Is PCB Etching Required? 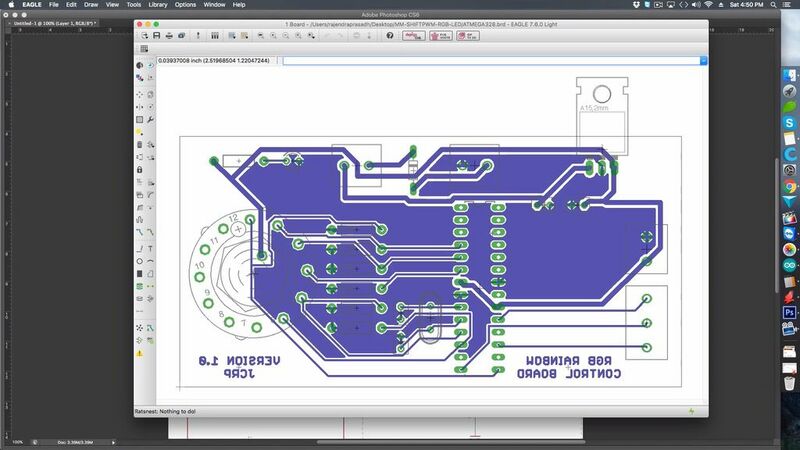 So when is PCB etching necessary in your project. In my last project which you can see here I required 5 boards of the same design. 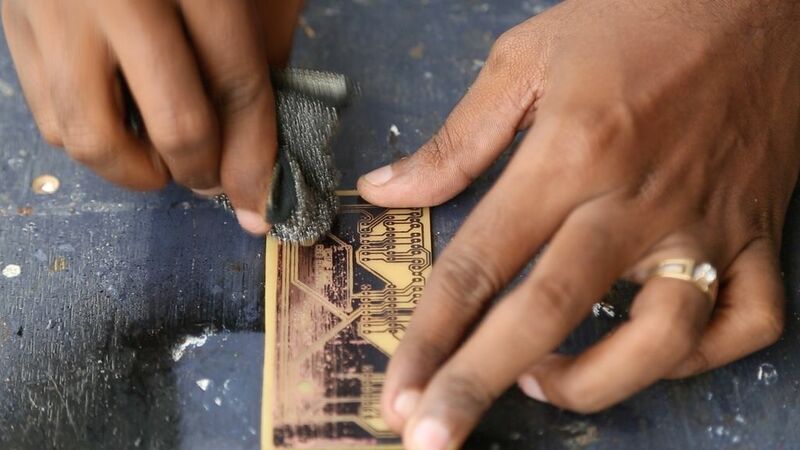 So when there is a process where you have to repeat the same design, PCB etching can be very helpful. 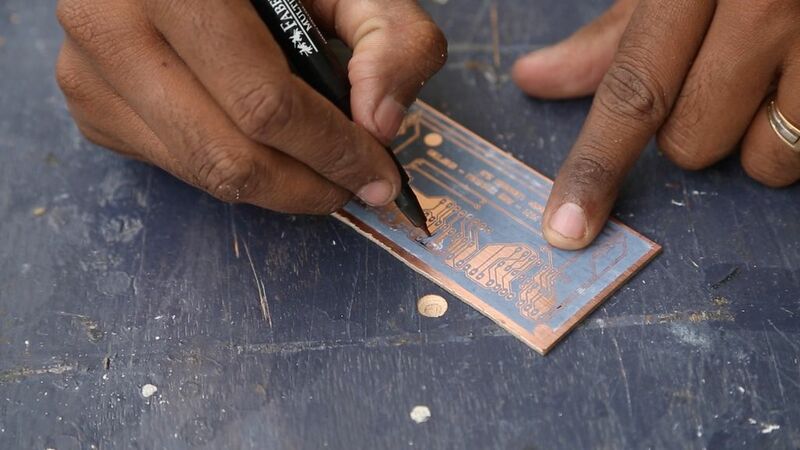 Also when you have some complex design which is going to take too many wires to make connection PCB etching can be really handy. I begin my designs using Eagle Cad. This is something I know well and has a huge community to help. Once the PCB design is ready I print that out to this glossy sheet. 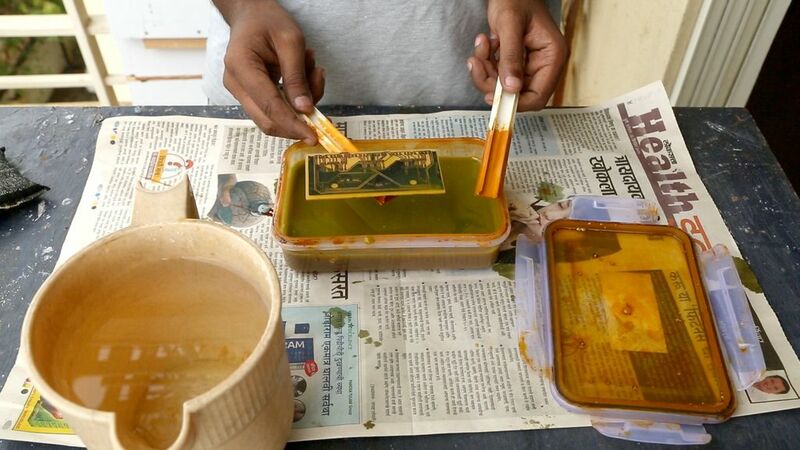 It is very necessary that its glossy sheet because in the next process we want this print to get transferred to the PCB. Only if the surface is glossy this would be possible. Also make sure that one side is glossy and other side isn’t. There are some art sheets which have both the sides glossy. That’s not ideal for our needs. 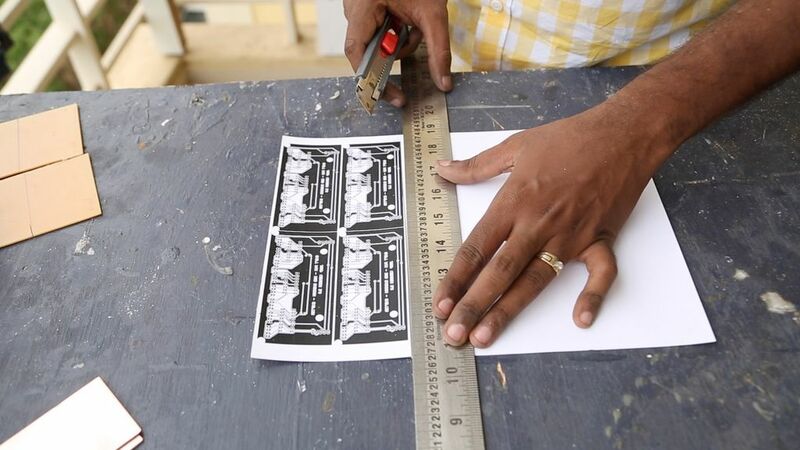 Next we cut the design to size. Your design can be of any size but copper clads don’t come in the same size. They come in standard sizes and the most common ones are this. I cut this using my jig saw. 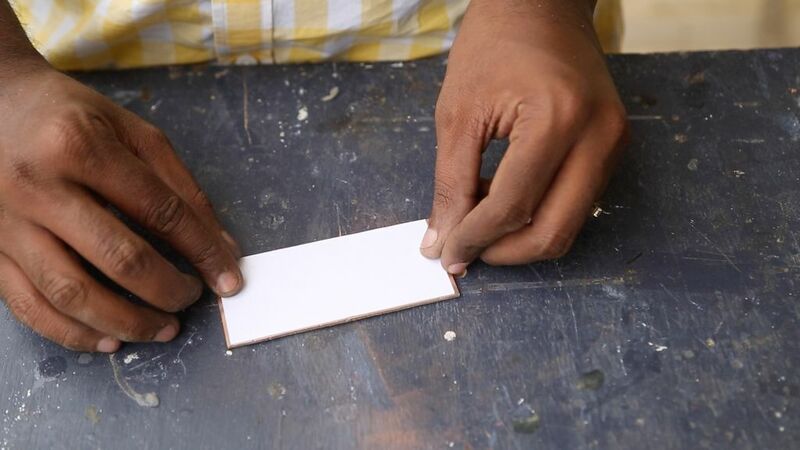 Cut with the copper side up to avoid tear outs. 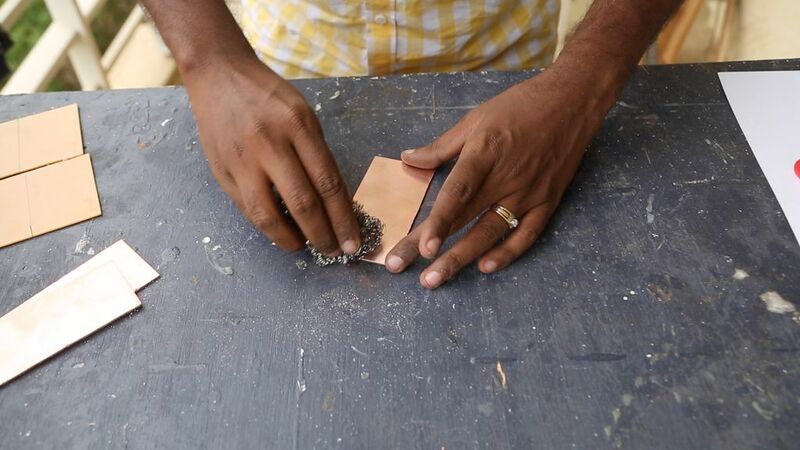 Once the copper clads are cut we need to prepare the surface so that the design adheres well. Copper tends to form oxidation very soon. So take this metal scriber and remove the oxide coat. Make sure to scrub the ends because thats the spot most miss. 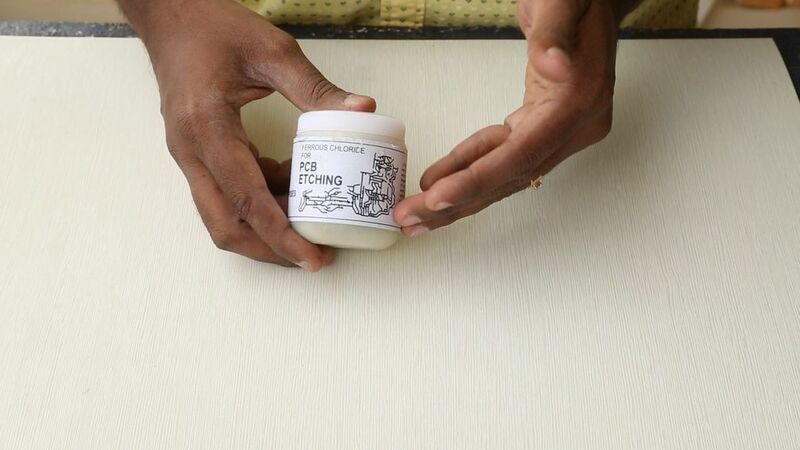 A few drops of acetone will clean up the surface of any dust. Now its time to move fast. 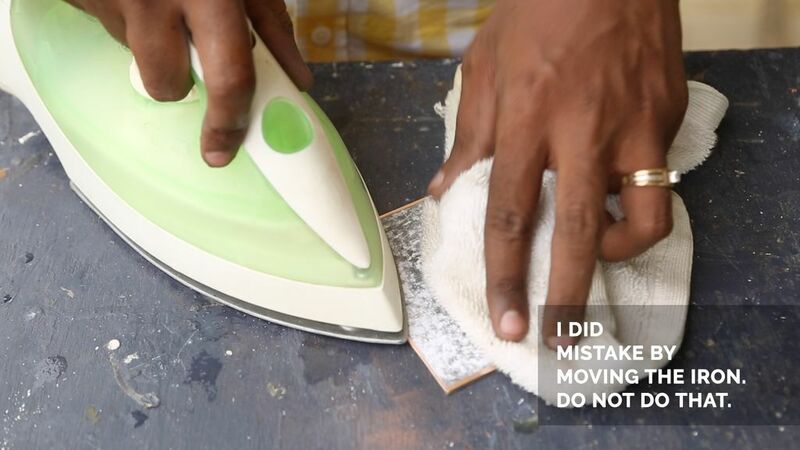 Make sure the iron is super hot. 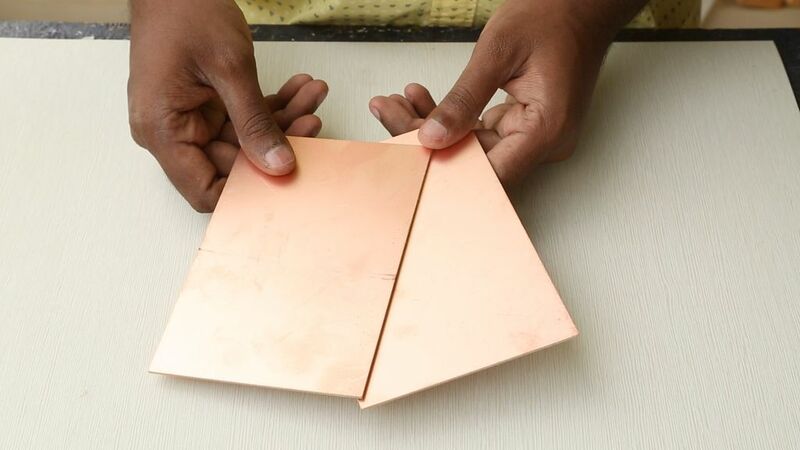 Position the design on the copper clad and start applying heat and pressure. 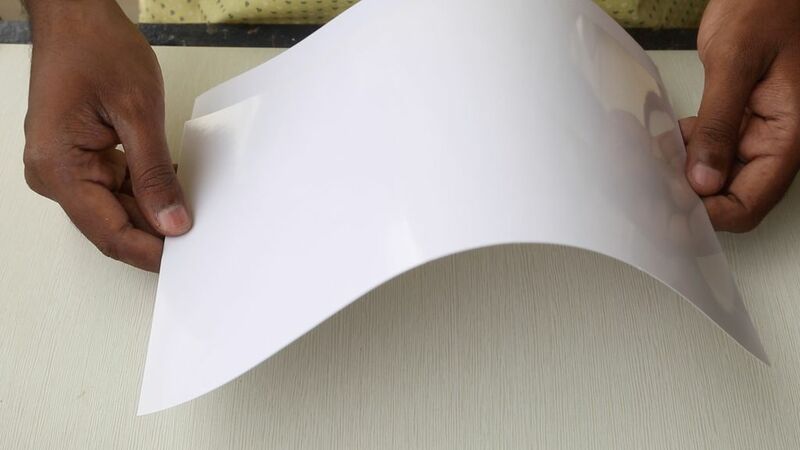 The glossy side of the paper is naturally sticky. So the moment you put heat and pressure it sticks to the copper clad and it wont move. 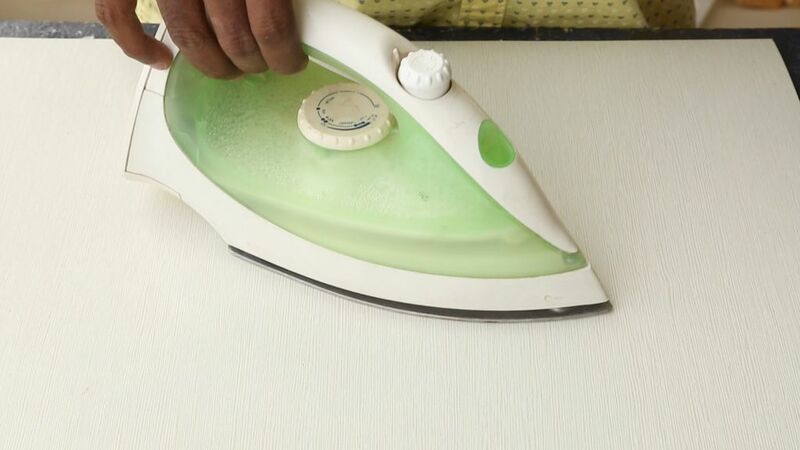 But if it was glossy on both sides then it would stick to the iron too. Thats why it is necessary that is glossy on just one side. 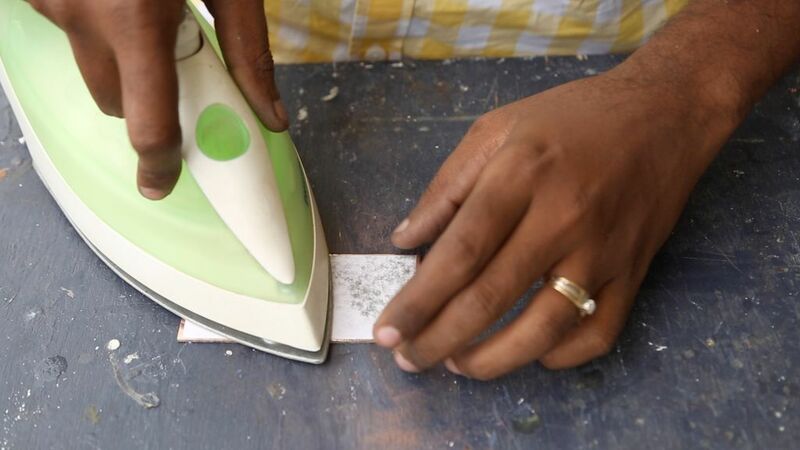 Don’t run your iron over the design. This would just smear the print. So apply heat for about 5 mins and apply some pressure. Get the cold water ready and drop the board immediately into it. It’s necessary that you drop it quick so there is sudden change in temperature. 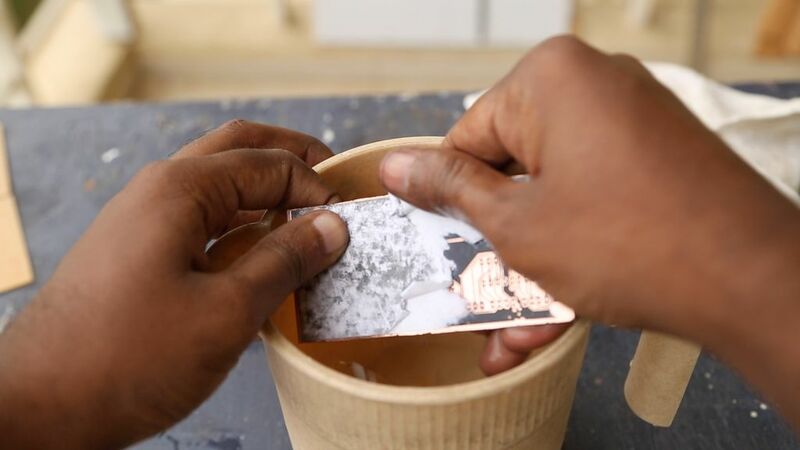 This ensure that the print stays in the copper clad. Then after a few minutes you can pick that up plate and its easy to touch. 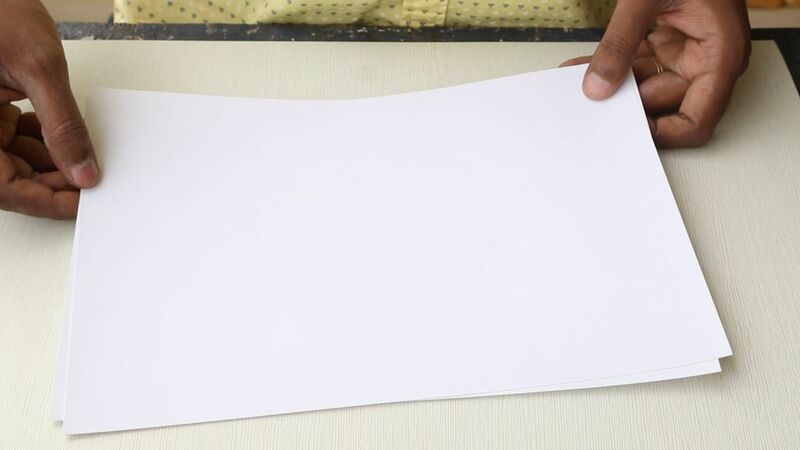 Slowly roll down the paper and gently remove it. You can see it transferred to the copper. Sometimes the design wouldn’t have transferred proper because of a number of reasons. So its always necessary to check that and fix it with marker. Make sure the marker is new and draws a good dark line. Once that is fixed the plates are ready for etching. Step 7: Making Ferric Chloride Solution. 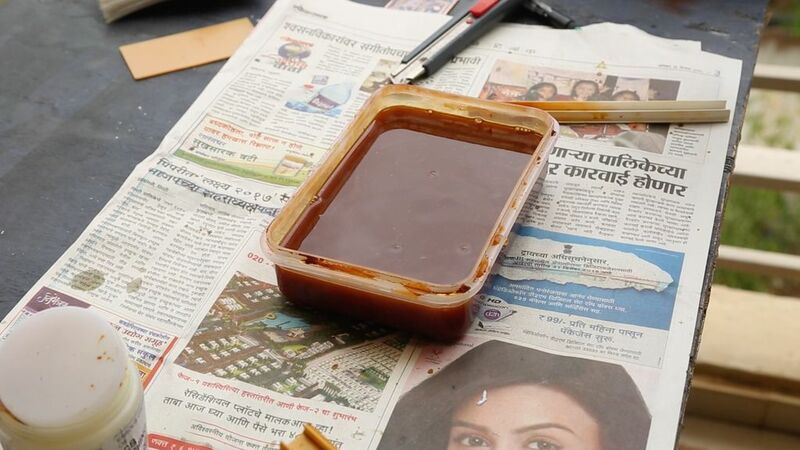 In India Ferric Chloride is sold in this container which has the ferric chloride powder. Just take a tray which has a good airtight seal and drop in the contents. The powder will soon dissolve but make sure to stir well so all is dissolved. Set it aside for a minute because it will start releasing heat. And make sure you do all this in a well ventilated area and on top of a newspaper. Because it will get very messy and this sticks to everything it touches. Drop the plates and wait. Stir occasionally so that the etching happens fast. The ferric chloride will eat through copper wherever it was exposed. 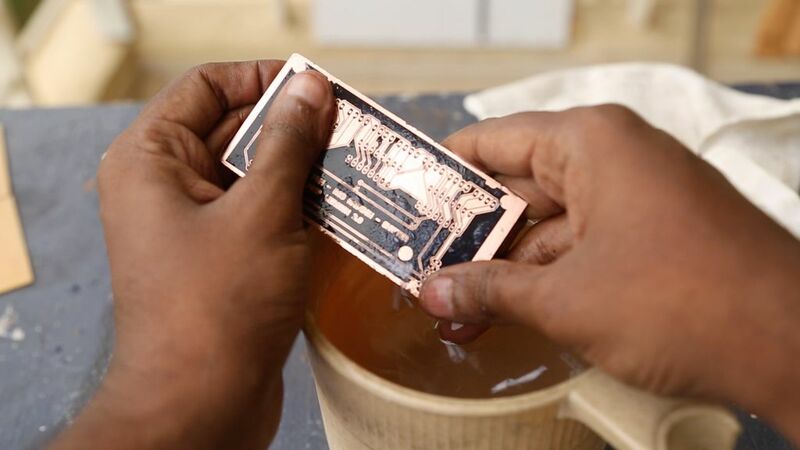 It takes a good 2 hours for it to etch through the entire copper. The temperature also matters a lot. I tired etch during the day and night. When its warmer and I see it doing a better job than during the night. 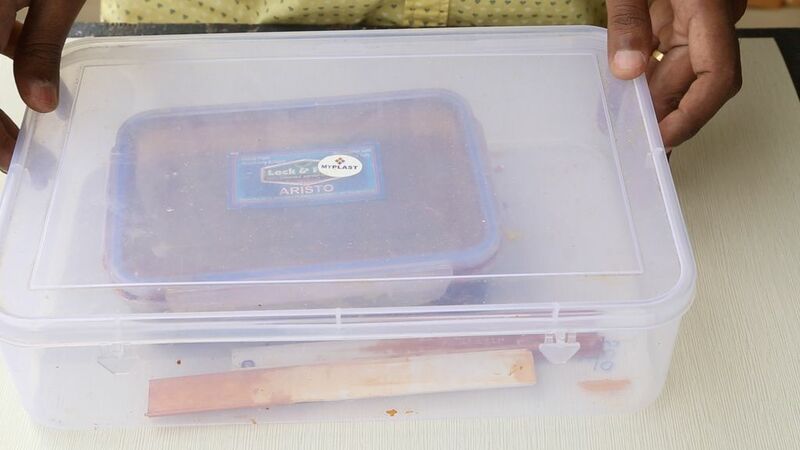 Check now and then take the plate outside the container. I have these plastic strips just for this purpose. You will see a good colour change in places where it has etched. 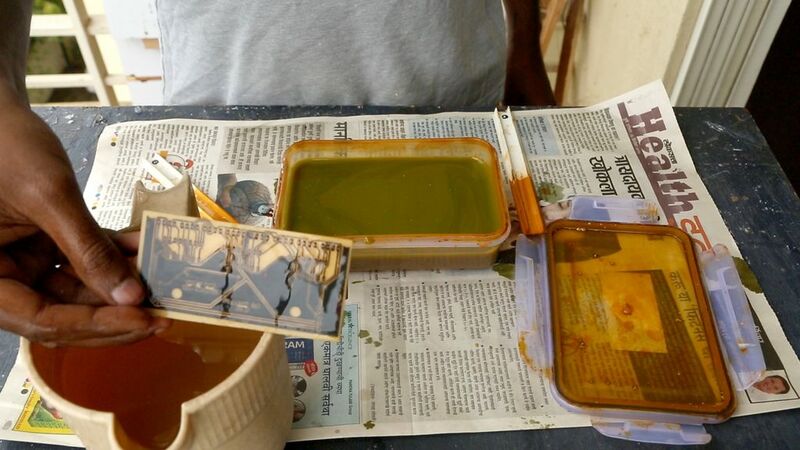 Drop the plates inside a fresh bowl of water to remove Ferric Chloride. Then look through the board against a bright light like this to see if it has etched properly. 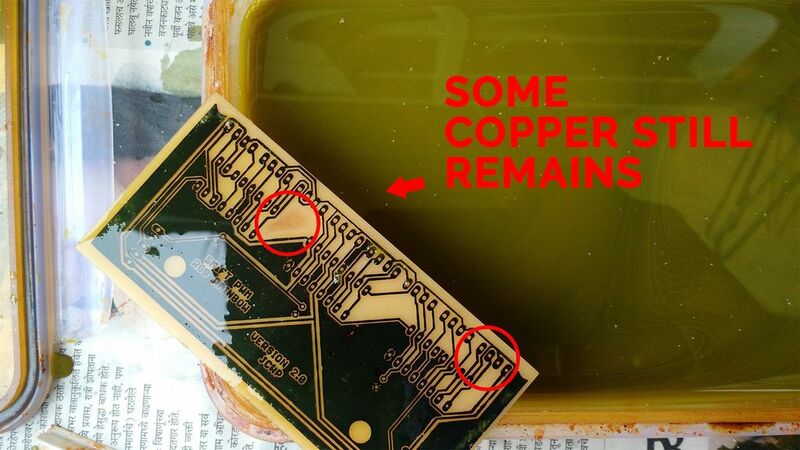 Even the slightest trace of copper will allow conductivity. So take your time in check it properly. If there are some traces still to be etched then no problem. Drop them again into the solution and wait. 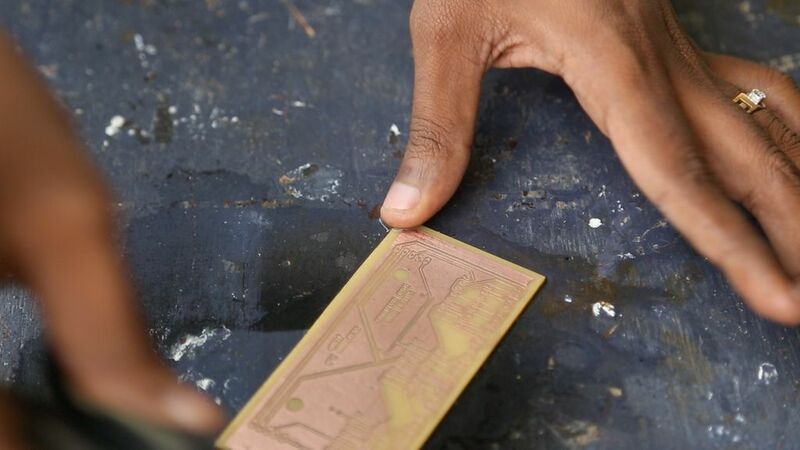 Once etched we have to clean away the toner ink from the copper traces. 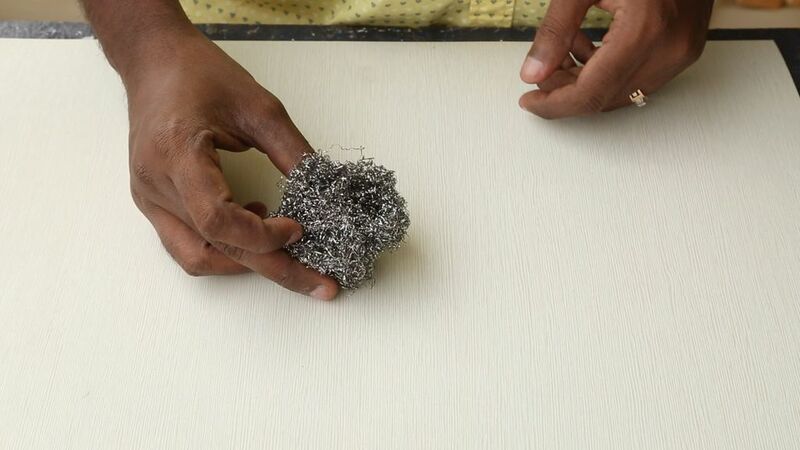 I do that with a metal scrubber. This time I do it gently because I want to remove only the ink. 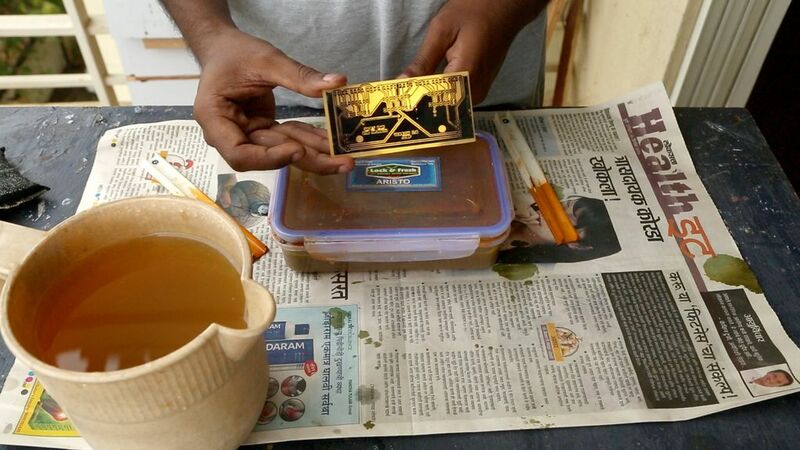 Its important that we do this step immediately after etching because there could be ferric chloride here and there and that can be still etching. So scrubbing makes sure that all is removed. Then set it aside to dry and it’s ready to solder. To drill holes to attach the components I use my home made mini drill machine. You can check out the video here. 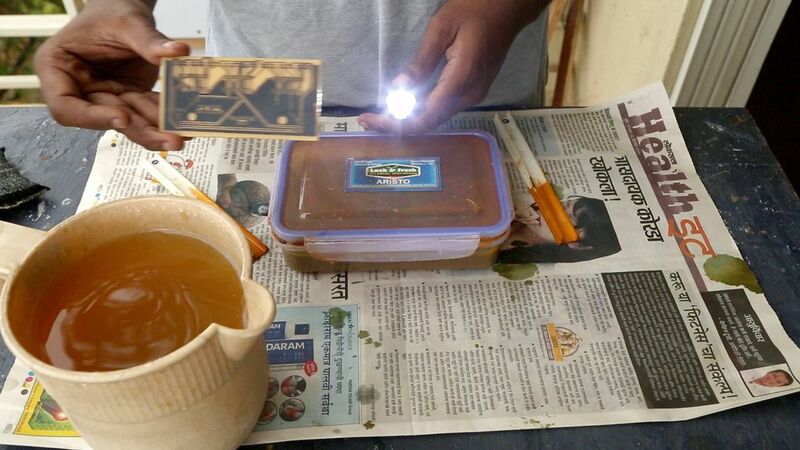 You can etch many plates with single batch of Ferric Chloride. 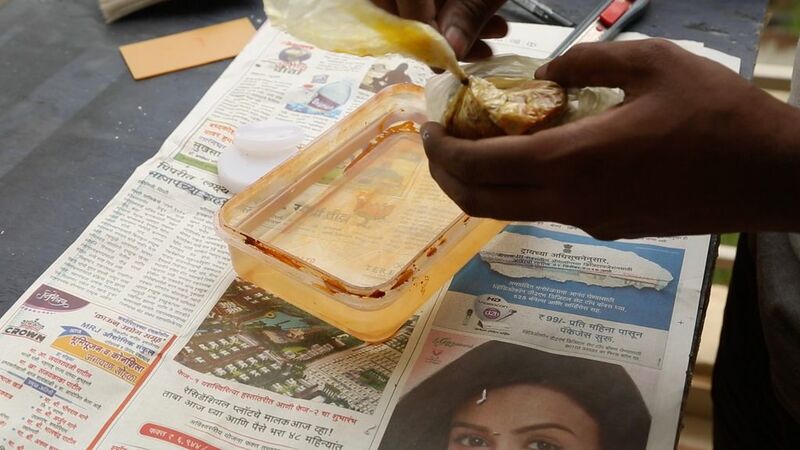 Thats is why it is necessary to use a airtight container. Close the messy container and drop it into another big container and store it in some dark place away from kids. Please remember that this is highly toxic and has to be handled with care. You would know that Ferric chloride has lost its etching capacity when it takes very long than usual to etch. Usually after etching about 10 to 12 boards. 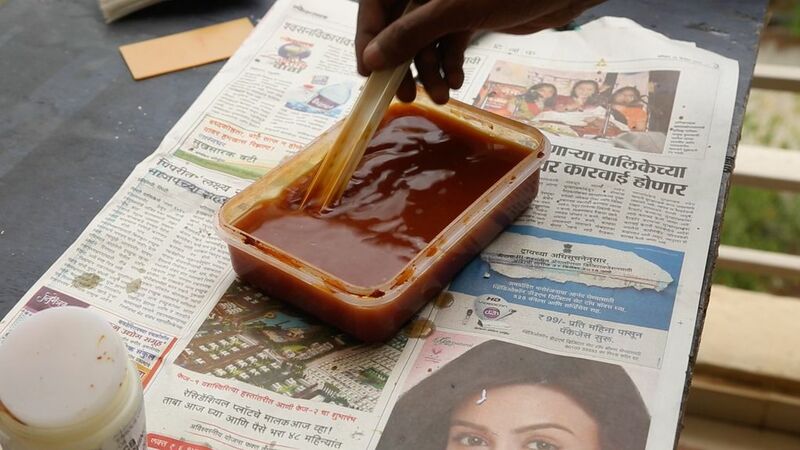 It is advised to dispose ferric chloride by rebottling it and dropping at the same chemical store from where you bought it. They can help you int the best way to dispose it. 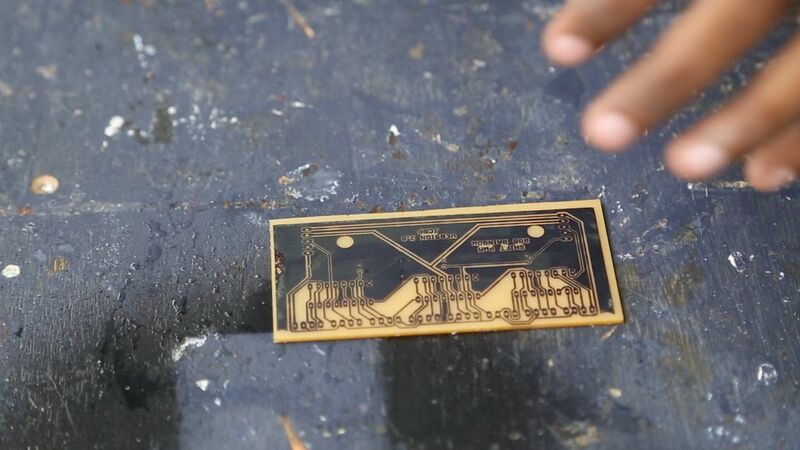 So as you saw there are a number of steps in etching PCBs. Not very complex but has to be done with care and precision. 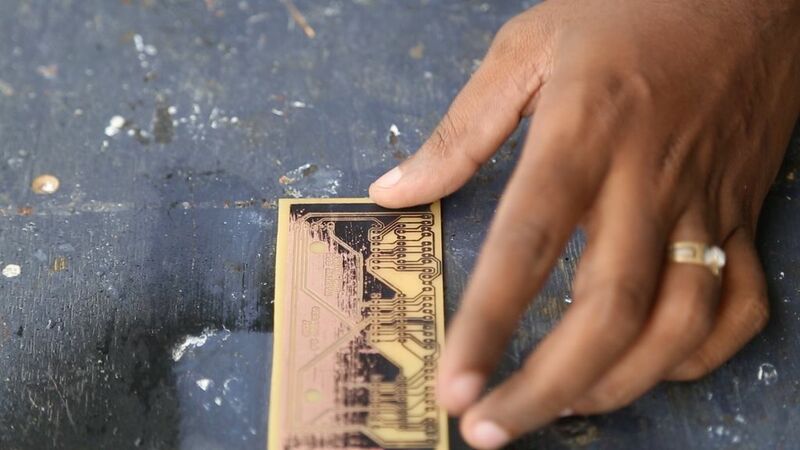 Now start making PCBs and make all those project which you thought were never possible. 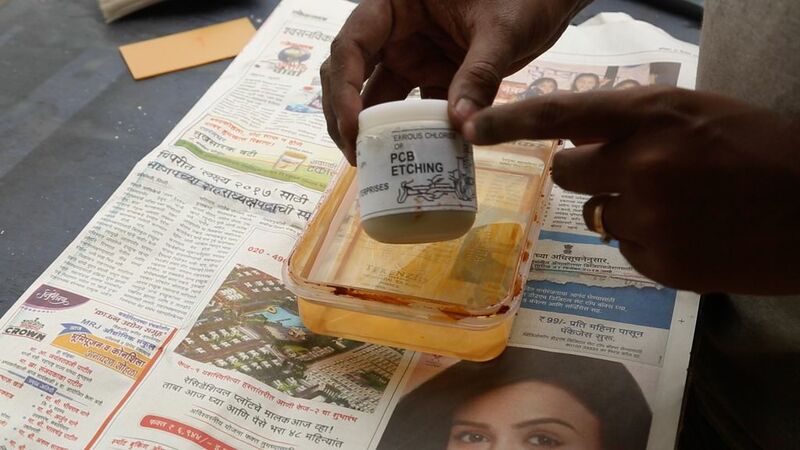 I hope I have covered all the grounds in this video about PCB etching using Toner transfer method. Soon I might make a video about etching through Photoresist film method. The exposing kinds. Will link that video when I get it online. If you enjoyed this write up subscribe to my channel. I have upload pics about my current project on instagram. So be sure to follow me there. Will see you next week with another project. Until then. Happy Learning!